We love London — the clue's in our name — but occasionally we release ourselves from the shackles of the M25 and venture further afield. On our travels, we've come across various things that make a great day trip. From individual museums and tourist attractions to whole towns and cities that are well worth a visit, here are some ideas for your next day off or long weekend when you want to get out of the city. Scroll down to the bottom of a page to see them all on a map. Not convinced by this whole leaving London malarkey? Ease yourself in gently with these wonders of the M25. 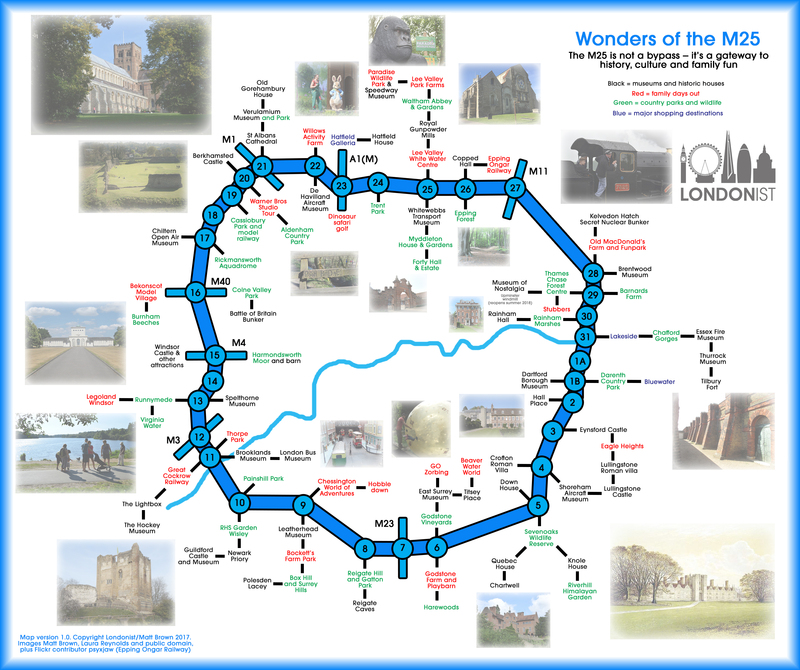 We've mapped 100 attractions, all just a short drive from the M25. 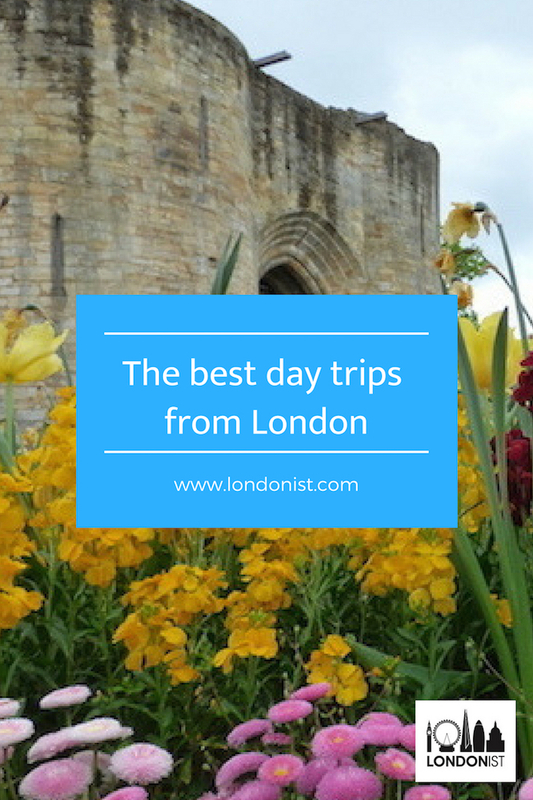 Caves, castles, an eagle sanctuary, a zorbing slope and a nuclear bunker are all on the list. If you're into castles, head to Tonbridge. SEVENOAKS: Just half an hour on the train from London Bridge, you'll find Sevenoaks, a town with a deer park, listed buildings and... ah yes, a yeti. Here's why you should go to Sevenoaks. TONBRIDGE: Just two stops on the train, or a 20 minute drive, from Sevenoaks is Tonbridge. 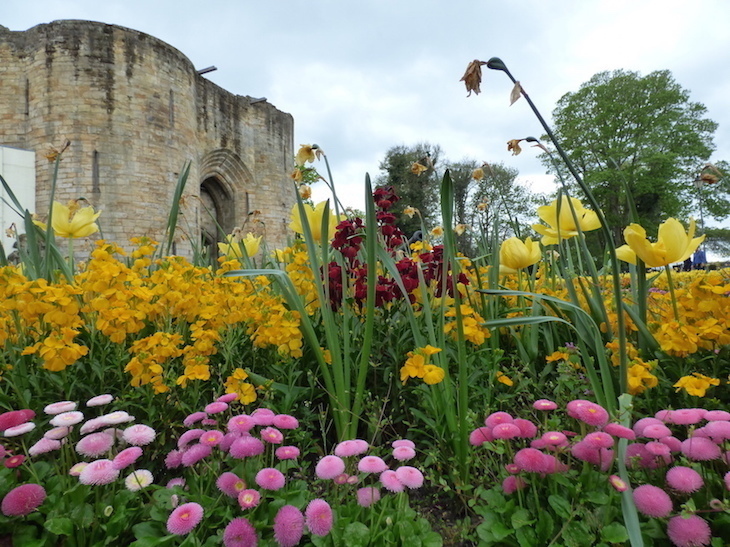 It's a smaller town, but it's got plenty to keep you busy for the day, including a castle, miniature railway, boat trips, and links to Jane Austen. Here's why you should go to Tonbridge. 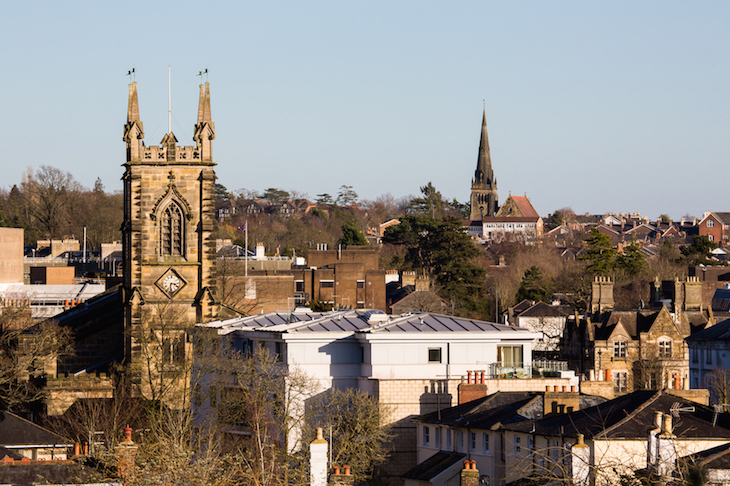 TUNBRIDGE WELLS: Better-known cousin of Tonbridge, with plenty of royal history, plus steam trains, rock climbing, and live music in a former public toilet. Here's why you should go to Tunbridge Wells. DARTFORD: Why not dabble in Dartford, a town in zone 9 with one heck of a rock 'n' roll history. Here's what we found when we went. KNOCKHOLT: The sleepy village that inspired Edith Nesbitt's The Railway Children is very close to the London border — in fact it was once part of London. We met some of the residents — but beware if you decide to visit, the station's a fair old trek from the village centre. TOWER TWIN: The Tower of London has a twin that's free to visit (albeit in a more ruined state). St Leonard's Tower in East Malling is managed by English Heritage and is thought to have been designed by the same monk as the Tower of London. PICK YOUR OWN FLOWERS: Blooming Green near Maidstone is a farm with a whole acre of flowers that you're allowed to pick (on certain open days in the summer month). Pay once for a bucket and fill it as full as you can — what do you think of our efforts? 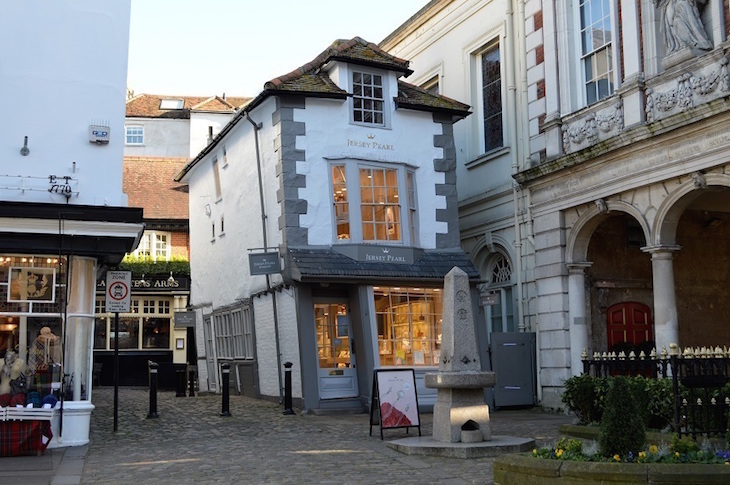 QUAINT VILLAGES: For your dose of country cottages and Tudor wooden beams, take a trip to one of these quaint towns and villages in Kent and East Sussex. One is a National Trust property — yes, the whole village — while another contains a former prime minister's country home. And then there's the one where Winnie the Pooh was born. BEACHES: Looking for a day at the seaside? Whether you're after bracing sea air and fish and chips shops, or the full sand, sea and ice cream experience, check out these Kent seaside towns to visit from London in a day... or make it into a weekend. BUS MUSEUM: In a rather misleading twist of fate, the London Bus Museum is actually located over the Surrey border. It's within the Brooklands Museum, on the site of the former Brooklands race track, so vehicle fans of all sorts are kept happy with racing cars, all vintages of bus... and those rusting airplane carcasses in the field outside. ARCHITECTURAL MUSEUM: This little-known but fascinating museum is home to former windows of St Paul's Cathedral and Windsor Castle, as well as doors from the old Wembley Stadium. Started by one man, it's now seeking funding to relocate, so it may not be in Cranleigh for long. 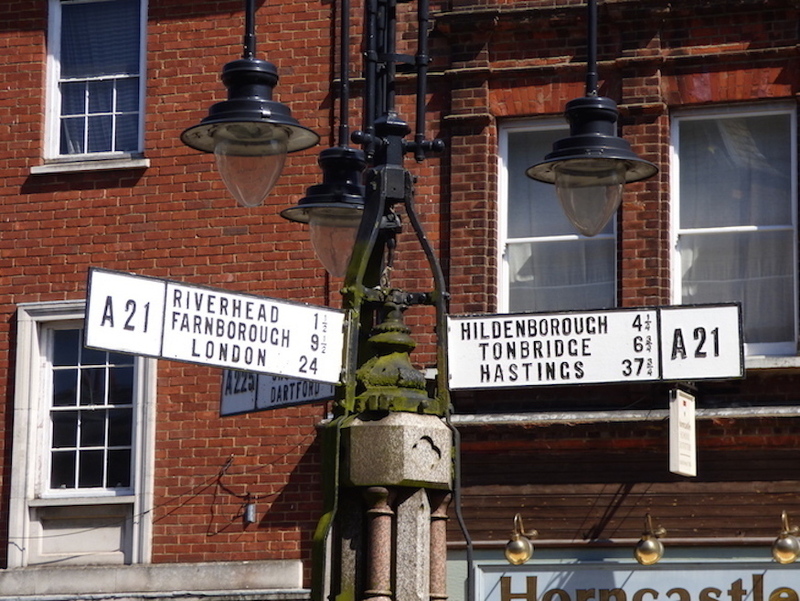 MAIDENHEAD: Located on the soon-to-open Crossrail route between London and Reading, Maidenhead is, or has been, the home to no fewer than seven culinary Michelin stars, the country’s oldest football stadium, and Theresa May. Here's what's going on in Maidenhead. SLOUGH: Bear with us here. If a taxidermy dog in a train station, Europe's largest trading estate, and a link to the astronomer who discovered Uranus don't entice you, we don't think there's a daytrip for you. Not convinced? Read more reasons why you should go to Slough. LITTLE ENGLAND: There's a replica of England just outside London. Bekonscot Model Village and Railway is the world's oldest model village, dating back to 1929. Wander among Lilliputian houses, tiny train stations and small circuses, or see it from the miniature railway. You can even peer into the world's smallest tube station. OUTDOOR MUSEUM: Visit 30 towns in a day at Chiltern Open Air Museum, which sits right on the Buckinghamshire/Hertfordshire border. Buildings from all over, including mission rooms, toll gates and furniture factories, have been rescued and resited to this fascinating attraction. ROMAN ST ALBANS: St Albans is the closest city to London — just 18 minutes from St Pancras. It is rammed with history. More Roman remains than London, beautiful medieval buildings, half a dozen pubs older than anything in the capital and much more. Its museum just got a major revamp, and you can now enjoy a cup of tea in the old courthouse. NATURAL HISTORY MUSEUM: London's ever-popular Natural History Museum has a smaller sibling, and you'll find it in Tring. Focus here is on taxidermy animals, which were part of Walter Rothschild's private collection. Unlike the South Kensington behemoth, you'll get round this museum in a couple of hours, leaving you time to wander around the petite but pretty town before you catch your train back to Euston. PETER RABBIT FARM: Beatrix Potter's fictional characters are brought to life at Willows Activity Farm, where they can suspend their disbelief via stage shows, a Peter Rabbit playground and Cottontail's Village. Peter not your thing? There's the usual farmyard fodder too; tractor rides, playgrounds, a sandpit, and of course, plenty of real life animals to befriend. MINIATURE RAILWAY: If you don't fancy venturing too far, Watford's Cassiobury Park is within the M25 and at the end of the Metropolitan line, and is home to this fantastic miniature railway. Choo choo! THE ISLE OF WIGHT TUBE: Did you know that you can ride a tube train on the Isle of Wight? 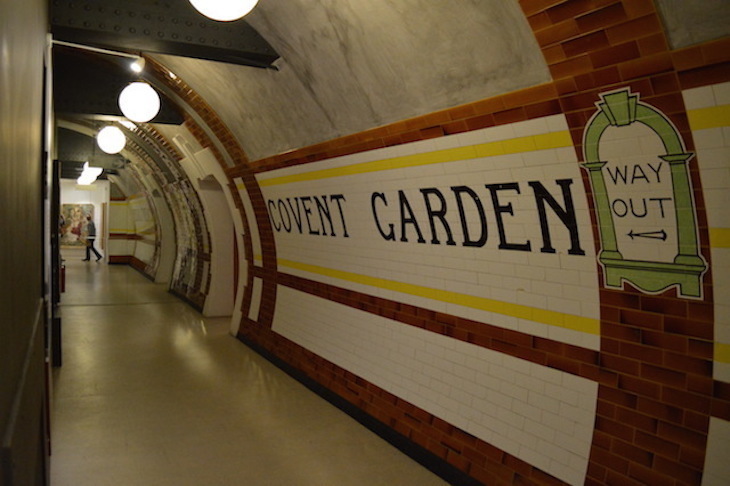 The 14km Island Line uses former London Underground stock which dates back to 1938? It's very different to London, as we found out when we took a ride. No jokes about a ticket to Ryde, thanks. CHANNEL ISLANDS TUBE: Some tube trains have ventured even further than the Isle of Wight and are now put to use on the Alderney Railway. Two former Northern line carriages live out their time chugging across the island between Braye Beach and the Quesnard Lighthouse, covering just over half of the island, pulled by a diesel locomotive.